How can you differentiate between dependence and addiction after using Adderall for more than a few weeks? Here we review the signs of Adderall addiction and how to address them. Are you wondering if you are Adderall dependent? When does physical dependence cross the line and become addiction? Here, we review the common signs and symptoms of Adderall addiction as well as recommended treatments for Adderall addiction. Then, we invite your questions at the end. Adderall is a distribution brand name for a compound pharmaceutical consisting of amphetamine and dextroamphetamine mixed salts generally prescribed for ADHD (attention-deficit hyperactivity disorder), narcolepsy, and is occasionally prescribed for cases of severe depression. Adderall is available as an instant release formula and an extended release formula, called Adderall XR. Adderall works in the brain by causing stimulation and excitation of the central nervous system. But in addition to the positive effects of Adderall use, physical dependence is expected, even when the medication is recommended by a physician. In fact, long-term use or chronic use of Adderall for a period of at least a month, or two can cause your body to need Adderall in order to function normally. The bottom line is this: you know you are physically dependent on Adderall when you stop taking it and experience withdrawal symptoms. You know that you are addicted to Adderall when you stop taking it an cannot stay stopped due to psychological cravings or compulsion. Dependence is a physical phenomenon. Addiction is a psychological phenomenon. 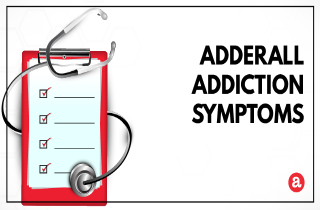 Adderall addiction symptoms: Can they be treated? Yes, symptoms of Adderall addiction can be treated. The first step in treating Adderall addiction is to address physical dependence to Adderall. At the moment there are no approved medications for treating Adderall dependence, however certain over-the-counter medications such as NSAIDs can be used to address withdrawal symptoms. Once Adderall is out of your system, then you must address the psychological aspects of the addiction. Adderall addiction, when properly addressed, can result in long term sobriety and abstinence from drug use (just like any other drug addiction). But how can you help someone that you suspect is addicted to Adderall? Have you ever heard of an intervention? It is a process of meetings with the addict’s family in order to plan and organize the further actions to get an addict treatment. Interventions require a thorough research into treatments and facilities options. After preparation, a direct discussion occurs with the addict, where the possible negative outcomes are outlined in order to encourage an addict to seek treatment. The two main options for addiction treatment are inpatient and outpatient treatment programs. Residential (inpatient) Adderall addiction treatment centers offer the full scope of evidence based practices for substance abuse, supervised by a professional staff, who are available to help for hours a day. This type of treatment is preferred when signs of addiction are more severe, because the addict requires a change of environment and structure. However, for those who can maintain their daily duties and address Adderall abuse simultaneously, outpatient addiction programs exist. During outpatient treatment, mandatory treatment requires weekly attendance at group meetings and individual counseling, usually over the course of 10 weeks or more. If you still have questions about the signs of Adderall addiction after reading this article, please feel free to post your question in the comments section below. We will do our best in providing you with a personal and prompt answer. I have been prescribed 20mg adderall for the last 16 years (I was 10). I usually would only take us during the school year and take a break over summer and winter vacations. Now that I’m in college , I still try to stick to my script but I often take more and end up staying awake all night studying. At least once every couple weeks. I feel like I can’t function in schoool with out it, I only take it when I’m studying and I take breaks on the weekends. But within the last 6 months I’ve noticed that the negative side effects outweigh the positive. Whenever I take it now, I get super speedy and distracted. And the comedowns make me extremely depressed and suspicious. I don’t like the person I become when I take it so I usually isolate myself when I’m studying so I don’t stress about acting weird. Having said all this I can choose not to take it because I don’t feel dependent on it physically by I definitely cannot function Day to day without it. So I feel trapped. I developed an anxiety disorder a few months ago and every time I would take it I would go into what Felt like a psychotic state , having repetitive racing thoughts and reckless behavior. I was prescribed anxiety medicine that thankfully stopped me from having that reaction to it.So would you say I’m addicted ? Or maybe my body is having a negative reaction to thestimulant? Within the past month or so i realized that my use of adderall to help me with classes in college has turned into an addiction. I am not prescribed, but one of my best friends is, and at first he would give me 20mg or so every other week to help with a major work overload. The year after we became roommates, and since the adderall was left out i began taking it once or twice a week, sometimes with him knowing and sometimes not. As my stress levels increased the adderall seemed to overload me, and instead of doing work i simply shut myself in and performed pointless tasks for hours. Over the summer break I was able to separate myself from the drug, and realized i needed to avoid it to keep away from it because i noticed how addictive my personality is. Unfortunately this school year i room with the same friend, as well as another friend who is also prescribed to adderall. As soon as i took it again i was hooked, and started taking it only a daily basis at a higher dose. I am no longer able perform school related tasks while on it, or off it due to the withdrawal effects. I am wondering what type of help i can get as an individual. I feel unable to tell my family because I still rely on their financial support, and fear the outcome of them knowing, and i also feel unable to tell my closer friends due to the negative response they might have. Hi Nancy. Have you shared your concern with other family members and friends to determine how they see the situation. If they agree there is a problem, figure out who will talk to the person about getting help. Contact a substance abuse professional, mental health professional, physician, or other helping professional to help you. There are many benefits of early detection and action. My 30 yr old daughter takes adderall. I am unsure of the dosage, but she takes a quick release tablet and also an all-day dosage each morning. She always seems agitated. Phone conversations can go on for hours, in which she does not allow interuption or comment. She talks very fast and changes topic randomly. She is very argumentive and will hang up if my comments are not in total agreement with her. When I question her taking of adderall she is very defensive and points out that is is prescribed for her difficulties maintaining focus throughout the day on her work. She and her husband are now separated and on the verge of divorce. Despite claiming to love him totally, she is always arguing with him and complains to me of his faults for hours. They are now divorcing. She has arguments with me, and her sisters to the point of destroying our relationships. She told me she has discontinued taking the adderall, cold turkey, however I know that she is still taking it. Given her defensive (paranoid?) state of mind, I’m not sure it is possible to intervene. She was truly a wonderful person 2 years ago, and now she is destroying all of her relationships. Any suggestions for what I can do to help her? Hi Maureen. You might want to consult a licensed clinical psychologist or a psychiatrist, preferably for family counseling sessions. It may help the communication in your family a lot, and it may reinforce your relationship with your granddaughter, as her mother is currently facing an addiction problem. She probably needs therapy for her addiction and her psychological condition. I found this site from Facebook. I guess I came looking to see if I do have an addiction or not. I’m still unsure. The last 5 months or so I have been taking Adderall. It is not prescribed to me. I take 20mg a day or sometimes only 10. I am a full time student in my 4th year of college, married, with 4 children. I originally started taking it because I had no energy and it helped me get everything done. My school work and overall life has become better. I am a manic depressive who also takes a low dose of depression meds and I have been told before I have ADD by an old counselor and my friend who is a current mental health counselor. I don’t get this high that I’ve seen people talk about. I actually feel more like a normal human being. I do get a rapid heart rate for about 2 min or so about 10 min after taking it sometimes, but it doesn’t happen all the time. I have asked my doc before about getting on ADD meds and she told me that it would counter act my other med which clearly from taking both is untrue. I have never felt better. I guess I’m confused? We had hoped that hospital staff (when our grand-daughter was in the hospital)…our daughter was out of control then, so we contacted the school (about her mother’s addition) and the child services-which found nothing to substantiate an investigation. I am at a loss as to how to get a hold of an agency that can help her. She is now in the paranoid state in which she claims the government is watching her and if she turns up missing , they are the ones responsible. Plus she has not had a job for over a year. We contacted the school about the situation because our grand-daughter was missing over a month and a half of school. It is my daughter that is responsible for the well-being of her children (ages 13 and 16) What can I do? Hello pheo. The phenomenon you describe are called “tolerance” (needing more of a drug to achieve similar initial effect) and “dependence”. Neither of these are addiction. Addiction is characterized by cravings and psychological need for a drug. You’ll need to consult an MD to talk about your options in terms of treatment, because if you are having trouble with narcolepsy or daytime sleep…pharmacological alternatives may be limited. Are there any behavioral treatments that can help you?